Ghana campus director Christa Sanders and professor Esther Armah with Anas Aremeway Anas. Anas always uses disguises to mask his identity for public appearances. 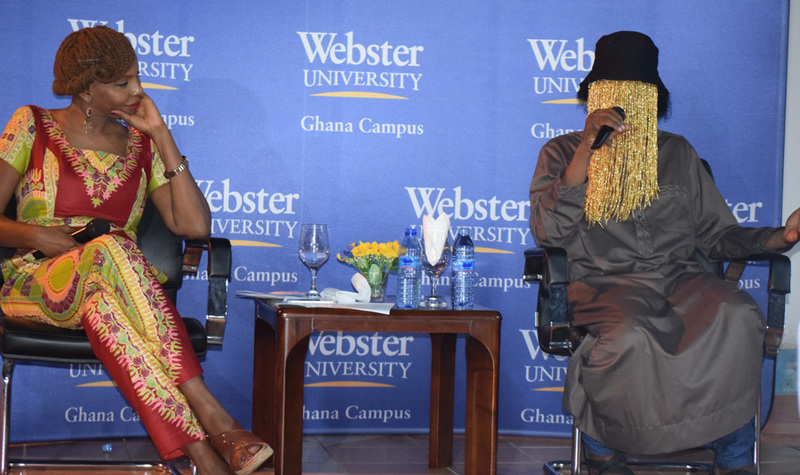 Webster University Ghana and EAA Productions hosted undercover investigative journalist Anas Aremeway Anas for the media summit "ReImagineGH2018: stories, standards and struggle" on July 19. The summit explored the future of investigative journalism in Ghana, what role investigative journalism plays in Ghanaian/African society and how educational institutions such as Webster Ghana could contribute to the development of investigative journalists through the offering of the Media Communications program. As an undercover investigative journalist, Anas has gained international acclaim for his work exposing corruption and human right abuses across sub-Saharan Africa and Europe in collaboration with international news organizations like Al Jazeera and the BBC. Some of Anas' most notable investigations include the murder of albinos in Tanzania for rituals, the exposure of a human trafficking ring spanning five countries in Africa and Europe and his most recent investigation of widespread corruption and match fixing in Ghana’s soccer/football sector which has resulted in the dismissal of several high ranking football officials. Professor Esther Armah served as moderator of the media summit, where Anas discussed the process of conducting investigations, the rigorous process of guaranteeing his work would stand legal scrutiny as well as security measures to ensure his own safety. The summit was attended by journalists, media owners, Media Communications faculty of several institutions as well as students as members of the community at large. 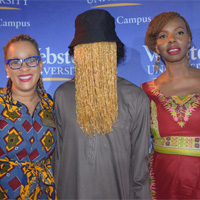 In her address at the summit, campus director Christa Sanders said hosting such an event was in line with Webster University Ghana’s desire to provide a platform for intellectual discussion and provided a unique opportunity to debate investigative journalism with one of the most renowned investigative journalists of the African continent. She added that as an institution, Webster University’s Media Communication course is designed to equip students with the necessary skills to effectively design and execute their own journalistic investigations. She expressed the hope that the media summit would lead to a deeper understanding of the practice of investigative journalism and inspire even more students to consider the profession. “We are incredibly honored to have Anas Aremeyaw Anas and Professor Esther Armah center stage tonight and we thank them for allowing us to be part of this important platform as we train our students on what it really means to be a ‘game changer’ and to make a true difference in society through the lens of the journalism profession,” said Sanders. Armah, who served as moderator of the media summit, presented a comprehensive history of investigative journalism, its industry, how it functions, where it fails and how it can and must strengthened for its future. In the course of the summit, Anas made a grand entrance in a flowing gown and full face mask flanked by several security personnel much to the amazement of audience. He was interviewed by Armah followed by a Q & A session. In an expose of his work, Anas walked the audience through the process of conducting investigations, the rigorous process of guaranteeing his work would stand legal scrutiny as well as security measures to ensure his own safety. According to Anas, he welcomes scrutiny of his work and sees it as a way to guarantee his work stands the test of time. The program was well attended and publicized and was a natural boost for Webster Ghana’s Media Communications program.